The mother of Leicester explosion victim Leah Reek said she felt her daughter was with her and other family members every step of the way as they took part in a 10k charity walk in her memory on Saturday. It was an emotional day for the Reek family, from Asfordby, as they completed the annual Twilight Walk to raise money for the LOROS hospice charity, who 18-year-old Leah was volunteering for before her tragic death in February. 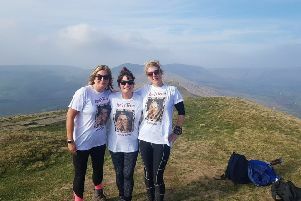 Mum Joanne and sister Molly were part of a 45-strong team who raised nearly £18,000 for the cause in an event involving 2,541 women which generated more than £100,000 in total for the charity. Mrs Reek said: “It was so emotional, the atmosphere was amazing. “Leah’s friends have decided they are going to do it every year. “The balloon release at the start was really poignant, watching all those memories float up into the air, it really brought it home. “The minute silence was beautiful, but very emotional too. “Then when we started the walk, I felt that Leah was with us with every step of the way. The circus-themed Twilight Walk in Leicester saw a 30 per cent increase in participants. Those that took part were treated to a whole host of carnival entertainment, and walkers came dressed as clowns, lion tamers, mime artists, circus acts and even fortune tellers. LOROS fundraising co-ordinator, Laura Fitzsawyer, said: “The atmosphere was just incredible, everyone that took part was amazing, we were also really lucky to have such beautiful weather on the day. “I’m pleased that so many women came along to support us and of course to remember their loved ones. “Over 180 volunteers supported the fundraising team on the day, it wouldn’t be an event without them, so a massive thanks to all that helped. “We’re really hopeful that we will raise over £100,000 this year, which is a record-breaking amount for the Twilight Walk. Go online at www.justgiving.com/companyteams/leahslegacy to pledge sponsorship for Leah’s family.